Elizabeth Lange was born in French-speaking Hispaniola, but in childhood she became a refugee in those late-18th century Caribbean upheavals. She was reared and educated in Cuba, and by 1813, had settled with other French-speaking refugees in Baltimore. One of the first needs she noted was the lack of education for free Blacks in Maryland. She taught classes in her home for well over a decade. She found an ally and advocate in a Sulpician priest, James Joubert, as well as Archbishop James Whitfield. 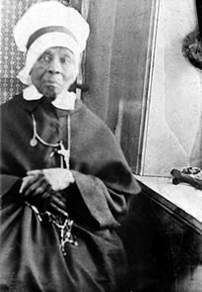 Miss Lange was encouraged to form a community, the first congregation of Black women in the history of Roman Catholicism. On 2 July 1829, the Oblate Sisters of Providence were a reality, Elizabeth and three companions having taken vows in a house–not a church or chapel. Archbishop Whitfield was succeeded by a Sulpician, Samuel Eccleston. While Archbishop Eccleston welcomed religious orders to his diocese, especially those who served European immigrants, he seemed disinclined to support the Oblate Sisters of Providence. In 1840, he ordered the sisters to disband. Fine expression of thanks, considering that some Providence sisters cleaned for his seminarians at St Mary’s. But Elizabeth declined to close shop. The community flirted with extinction with a lack of support from the Sulpicians, a dwindling student body at their school (founded 1828), and the departure of some key leaders (one of whom moved to Michigan to found the IHM’s). Through her long life, Mother Mary Elizabeth Lange held on to the original vision of education. Her school, St Frances Academy, is still in operation today, nearly two centuries later. Poverty, racism and sexism couldn’t keep this worthy woman from fulfilling her dream and providing for the dream of so many young Americans at a very difficult time in our nation’s history. She seems a worthy entry to conclude this year’s series on Worthy Women. This entry was posted in Saints, Two Weeks of Worthy Women. Bookmark the permalink.